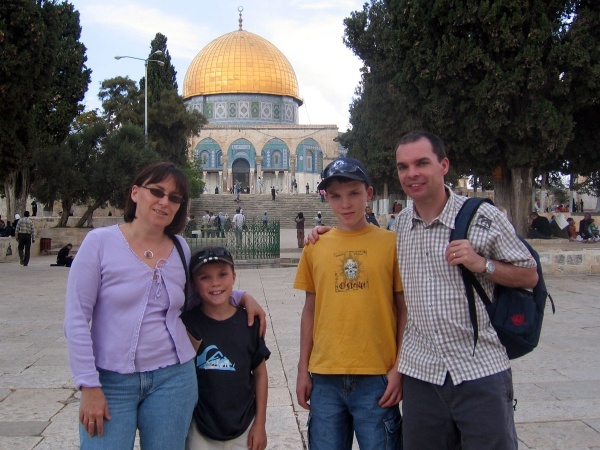 With Liz and Paul 'out of Africa', this was our first chance to visit them in their new home, Tel Aviv. My Dad was there when we arrived, heading for home mid-way through our stay - the first time Dad, Liz and I have been on holiday together for 20 years! The flipside of preferential fares is flying on stand-by ... or should I say, not flying at all? Hence, our enforced stop-over en route to Israel. Jaffa, first inhabited 4000 years ago, is now a southern suberb of Tel Aviv, its much larger and younger neighbour. With Liz as our guide we visited Jerusalem. A remarkable city - from the 'Wailing Wall' to the Dome of the Rock to the Church of the Holy Sepulchre in a few short steps. From Tel Aviv we set off on a two day trip to see some of the sites of northern Israel. First stop, north-east from Tel Aviv, was Nazareth and the Church of the Annunciation. From Nazareth we headed north-east again towards Tiberias and the Kinneret, or the Sea of Galilee, the site of numerous biblical stories and equally numerous churches to mark their locations. The last stop on our tour was Caesarea - another site of immense historical interest, stretching back to the days of Herod and beyond. It wasn't all churches, temples and mosques, you know!